Looks like a dog or dingo. What you are thinking is the tail looks like a branch from the fallen tree, right next to it. If what we're seeing as the tail is a branch, I think the stripes on it would be damning. Are you really going to go down some Appeal to Authority rabbit hole? No, I don't agree with them. However, nor do I disagree with them. I'm agnostic about the film and I'm agnostic about their claims about the film. It's just ridiculous to say "X & Y debunked it" with any more authority than "A or B claimed it" without anything other than "in my opinion" being attached to each argument. Maybe he didn't; maybe that's just the only one that was worth a damn so it was the only one he kept, or the only one he submitted. I very often take multiple shots of things with my phone camera but only end up keeping the best-looking photo. Yep, you would certainly delete all the photos that don't have the animal turning to you and saying cheese...if you're insane! The difference being that that's a dog. I don't know much about thylacines but I do know about dogs, and that's not one. My point was, that it was brought up before, and debunked by a wildlife biologist. You sound like a kook right now. I know it's not a dog because I'm familiar with dogs and nothing about that animal makes me think of dog, not the gait, not the rear legs, not the tail, not the neck and certainly not the head. Very few dogs have heads of that proportion (<--- there's one of them) and this is not one of those breeds. You could cobble together the individual characteristics from various breeds but that's not how cross-breeding works. If I had never heard of the thylacine I'd still say that was a marsupial. Are you really suggesting that animal sightings aren't followed up? I'm happy to suggest that many (most?) animal sightings aren't followed up, for reason that I hope will be obvious (if not articulable) by the end of this post. I personally moved the northernmost boundary of the range of the African Black Footed Cat some 400 miles, with a well observed and recorded sighting, at night and without a camera, in the Kafue National Park, Zambia. Are you really saying that no-one should have followed up my claim to have seen an animal hitherto unknown north of the Zambezi? Cool story, bro. I had a well observed and recorded sighting of a polar bear in Puget Sound over the holiday. Personally moved the boundary, hitherto unknown south of etc. I'm not saying someone *shouldn't* follow up on my sighting. I'm just saying I don't see why anyone *should* follow up on my sighting. Or yours, for that matter. Also, what does "well-recorded" mean, without a camera? Was it an audio recording? Or just a realistic account of having seen something interesting? .....You sound like a kook right now. I refuse to use the report system here any more, but you might want to have a little look at rule 0 and 12. Declaration of extinction is fraught with problems and human fallibility. Do you want me to start listing all the animals which have been declared extinct only for a remnant population to be discovered subsequently? There are some nice examples from Australia you might be interested in. Further, Australia has a land area of about 3 million square miles compared with the USA at 3.8 million......and a population of 20 something million compared with the USA's 300+ million. That means there are vast, vast spaces without people. If there is a country where a population of animals could have survived unnoticed for 80 years, it is Oz. If that was it regarding thylacine, that would be enough for most people to retain some sense of "it's not impossible.........", but that isn't it. Obviously you didn't bother looking up the report I referenced previously by the Tasmanian wildlife officer who reported a clear and continuous close quarters sighting of a thylacine in the 1980s, but you've obviously discounted it. He must be a kook. The fact is, these animals, which are known to have existed (they're not makie uppie cryptids), are still being reported throughout their previous known range, and have been since they were declared extinct. They were reported regularly when I lived in Oz. For some people, that would at least lead to allowing for the possibility that there were pockets of surviving populations. Obviously not for you. Obviously, declarations of extinction are sacrosanct for you. Fine. You don't want that list then of all the extinct animals which have been removed from the extinct list, then. Go on.......call me a kook again, if it makes you feel better, because I remain open to the possibility that a wildlife service in the 1930s didn't have all the necessary information to make a declaration of extinction. Well the fact is that they did, found the animals precisely where I told them they would find them, and re-drew the maps of their known range. Last edited by MikeG; 9th January 2019 at 09:10 AM. It looks much more like a dog than a thylacine to me. That's also where I would put my money. Either that's a dog with a very deformed tail (never seen a dog with a tail like that), there is artifacting from digital compression, or intentional image manipulation. Not sure why people are quite so dismissive of the possibility that this is a real Tasmanian Tiger. Yeah this is a skeptic forum, and I am skeptical about it being real. But as MikeG said, actual wildlife officers have reported sightings, and we know they existed in the 20th century. This isn't akin to "Bigfoot". It's an ISF thread that's on for more than one page. What did you expect? It's a perfectly cromulent response to an argument by unsupported personal anecdote, especially on the Internet. It may well be a "fact", but it doesn't establish that any arbitrary claim of a sighting *should* be followed up. Do you think anyone should follow up my sighting of a polar bear in Puget Sound? ETA: And someone should probably update Wikipedia. They're apparently still using IUCN Red List data, which does not reflect your sighting nor the re-drawn maps. It's still not clear to me that your claim should have been followed up. Hell, it's not even clear to me that your claim *was* followed up, beyond perhaps radioing a park ranger in the field and telling him some tourist thinks they saw a Black-Footed Cat and maybe he can keep an eye out? Were you there when they re-drew the maps? Who? Which maps? Can we see them? I'm serious about updating Wikipedia. If there's better information out there than what's currently available, I mean. Last edited by theprestige; 9th January 2019 at 10:01 AM. If I lived in Australia and saw a Tasmanian tiger the last thing I'd do would be tell people about it. Why would I? .......Do you think anyone followed up my sighting of a polar bear in Puget Sound? Did you do anything to get it followed up? Did you report it to the relevant zoological society, or a uni? Did you take a GPS location? Did you write up contemporaneous notes and make them available to the park authorities and the world experts in the species? Did you do follow up Q&As with specialists? Did you lead park rangers back to the spot? No? Well, I don't suppose they're mind readers, so I'm guessing not. That's the citation for the claim in the Wikipedia article on Thylacines, by the way. Notably, it's not a "wildlife officer", but rather a "researcher with the Tasmanian National Parks and Wildlife Service". And both the Wikipedia entry and the source article go on to say that the sighting spurred an extensive search that turned up... zero thylacines. That's pretty weak sauce, especially from someone on a hair trigger about other people's appeals to authority. I'm surprised there isn't already an xkcd about how, as time passes without a conclusive result, the evidentiary value of each new inconclusive sighting decreases. 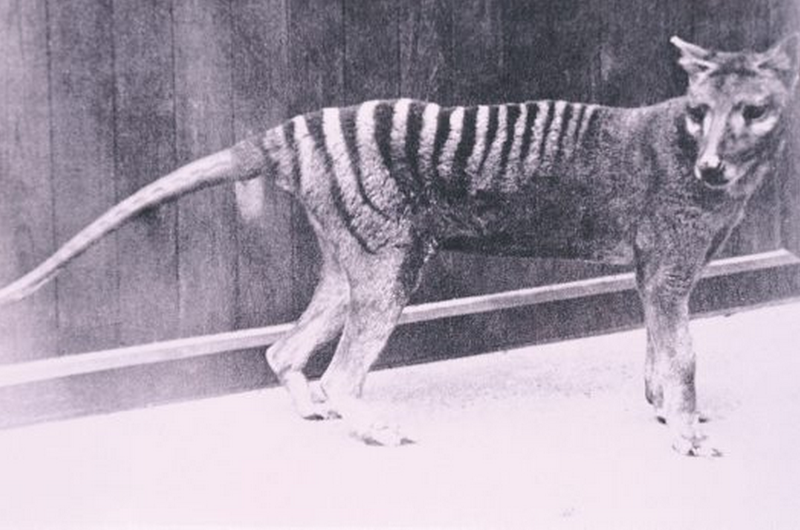 "Here's a blurry photo of a thylacine in the wild, probably." "Well, thylacines are still around here and there, so probably yeah it's a photo of a thylacine." "Dude, nobody has done better than "blurry photo... probably" in almost a hundred years. Probably that's not a thylacine." Why does Kim Kardashian do... stuff? When you got back to the spot with the rangers, did they find the cat? Whether I should have or not, I did. ........When you got back to the spot with the rangers, did they find the cat? They (we) found the spoor of the cat (they're nocturnal and live underground, so actually finding the cat there and then would have been pretty unusual). At that point they were still convinced that I had seen a juvenile African wild cat. They then set up a camera trap, and after I had left the country, they captured photographs of it, an African black footed cat. ETA You'll need a good deal of effort to persuade me that there is anything more on the African black footed cat that is of relevance to the subject under discussion in this thread. I'm not interested in giving the moderators excuses to ding me. Last edited by MikeG; 9th January 2019 at 10:38 AM. Do adult thylacines have stripes further down than the base of the tail? Wiki says they do not. In some photos it looks like I can see a decent stripe or two at the base of the tail, and some very faint stripes near the end, with not much in the middle. I don't think I've seen a pic of an adult with an obviously striped tail? Are you really saying that no-one should have followed up my claim to have seen an animal hitherto unknown north of the Zambezi? That's a question of should. So what's your answer? Should your sighting have been followed up (by you or anyone else)? 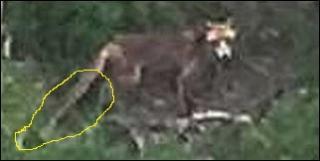 Should this alleged thylacine sighting be followed up? Why or why not? How is your answer informed by your anecdote about the Black-Footed Cat in Zambia? You're the one who brought up the question of "should happen". Now you're falling back to the question of "did happen". Do you actually have an answer to the question of "should"? I think the example of a Black-Footed Cat sighting is as good and relevant a basis for examining the question of whether all such claims should be followed up. A question that you asked, no less. But yeah, we don't have to talk about your Cat sighting if you don't want to. I'm only interested in what it might have to contribute to your argument about whether sightings should be followed up. If you want to answer the question of "should" purely in the context of this thylacine sighting, be my guest. All I'm really interested in is your answer to that question: Should all claimed sightings be followed up? ETA: I do note, however, that while you claim there exist both photos and redrawn maps that substantiate your claim, you have cited neither, and are now rejecting any further inquiries into your anecdote. What exactly did you intend your anecdote to do in this discussion, if you actually believe it's off topic and refuse to examine it? Last edited by theprestige; 9th January 2019 at 11:12 AM. There's a black and white photo of one in the OP with an obviously striped tail, I don't know if it's been edited. Well, let's look at the figures on this particular sighting which are far more relevant. The City of Greater Geelong, which includes the Bellarine Peninsula has a permanent population of 250,000 which swells into probably 300,000+ in Summer, and a lot higher if you include day trippers. The total area is in the order of 1,500 sq. miles. The total inaccessible bushland is zero. That alone makes it highly unlikely to the point near impossibility that a breeding population of an extremely rare, possibly extinct animal has existed in this highly populated, popular, and relatively small area in the past 100 or more years and never been sighted before last weekend. Last edited by fromdownunder; 9th January 2019 at 03:12 PM. A/ I was talking in general terms about thylacines and other "extinct" species, and not just about that photo......and therefore obviously not just about that place. Interesting to note that Geelong is apparently much more urban than when I used to visit. B/ Do you know how much ground they cover/ed? No, neither do I. Animals move about, and just because something might have been seen in an area doesn't mean a population survives permanently in that specific location. C/ If this is a mangy dog and a striped stick, it doesn't change the point I was making. You need to catch them first. Even in that photo, I'd call the stripes on the tail weak compared to the stripes on the back. It probably has been retouched, though. The video is not really high quality and the tail looks blurry to me. I just don’t see this as particularly good evidence for a thylacine when there could be much more likely explanations for it. I get that claims about thylacine sightings are not on a par with Bigfoot, but claims still need to be evaluated proportionate to their likelihood. Just as SETI researchers will try to arrive at explanations in the reverse order that UFOlogists too, skeptics should probably try to do the same when it comes to sightings of unlikely animals. I think the "stripes" in the OP pic are not stripes, but the way the tail is shaped. The indentations between tail bones? You can kind of see the tail bones? When did you visit? 1950? The population was over 100,000 by 1965, not counting outer areas like Drysdale, Portarlington, Lara etc. And even then, the Peninsula was a very attractive tourist resort in Summer. In the '50's we used to stay at St Leonards, shop in Portarlington, go to the pictures on the Beach at Indented Head and fish off Clifton Springs. We were certainly not the only family to do so. Probably only three possible places for a potential Tassie Tiger population in Victoria are the Otways and the Great Divide, where there is still quite a bit of virgin Bushland and some small parts of Gippsland. These are fair walks for a dog population never sighted there, and never sighted while migrating, even though they would have to walk through large open and decently populated areas to get there from here. Last edited by fromdownunder; 9th January 2019 at 04:56 PM. I'm curious. Why did the spawn of criminals, lolligaggers and layabouts decide that this beautiful creature needed eradicatin'? That would be cool if it was a prehensile tail. Last edited by Elagabalus; 9th January 2019 at 04:56 PM. The argument was (erroneously) that they were killing too many sheep, so the farmers had carte blanche to destroy any they saw. There was even a Government paid Bounty for every kill which supplemented people's income nicely. Last edited by fromdownunder; 9th January 2019 at 05:06 PM. ...Not sure why people are quite so dismissive of the possibility that this is a real Tasmanian Tiger. Yeah this is a skeptic forum, and I am skeptical about it being real. But as MikeG said, actual wildlife officers have reported sightings, and we know they existed in the 20th century. This isn't akin to "Bigfoot". Also, if you haven't made up your mind by now you're setting the cause of Skepticism™ back a hundred years. Choose your tribe, man! Huh? Why wouldn’t you? Is it because people won’t immediately believe you. Sorry, but that’s the way it is. I would hope you would have a camera or smartphone on you. It wouldn’t be that difficult to document in that case. To me, the head and body look like a fox. To me none of it looks like a Tasmanian tiger. Only the tail is vaguely suggestive and that is suspicious. Similarly the videos posted here don’t look that much like Tasmanian tigers either. None of these animals have visible stripes. here is a blowup of the animal from the JPG we've seen. It's clear that it's undergone a great deal of post processing but with the great deal of technology involved in cell phone image processing, it all could be automatic and involve no purposeful manipulation at all. But then it could. As you can see (and can see even better if further sharpening is applied) the processing has occurred in squares, and the boundaries between squares are not smoothed in the same way the boundaries within them are. The image has been processed in some way that has multiplied the pixels enormously, and zooming far past the point when a high density SLR image would be pixellated, it still is fairly smooth. When it does reach the point where pixels can be detected, their edges are soft. To get a decent image out of the tiny sensor of a cell phone, the built-in post processing is enormous and complex. If you look at the animal itself, notice that the stripes on the tail appear to extend beyond the tail itself. This could be another artifact of the way the image is processed, but it's odd. Likewise, the strange shape of the tail may be a byproduct of the way areas are processed and smoothed by the software, which appears to form color blocks, and those blocks sometimes seem to overlap their presumed edges. Look for example at the nose of the animal, whose cheeks seem to bloom out past the recessed nose. And yet, although there appear to be definite stripes in the tail, no corresponding stripes appear on the body. Again, of course, this could be a byproduct of the image processing, but it's a little odd. Of course if a fox can be mangy, why can't a thylacine? I remain skeptical, because I think the image is simply not good enough to judge accurately. I'm seeing a slightly different view to that photo. Here's the kind of bushland this photo may have been taken in. Note the ferns, plenty of "stripes" there. Now consider the part of the "tiger" photo that I have identified. Could that simply be a fern that the animal is behind or beneath?